I’m not an avid NFL fan, but I do have a few favorites (Saints, Chiefs, and Dolphins). I pick who’s going to win games (I was second in a group going into this week) and I monitor results, but that’s mostly it. This is my only other NFL Blog this year: “How I Would Re-Align the NFL”. I just don’t get into it enough to blog about it generally. I’m writing this because even though I’m pretty good with this stuff, I had some trouble figuring out the playoff scenarios with today’s results in mind, so I thought I’d share what I found out. I’m sorry if this comes across as too pedantic, but I try to write it so that people who might not be extremely familiar with the process can still follow along. I’ll go into more details about the divisional spots at the end (at least one team makes the playoffs from each division regardless of how they compare to teams in other divisions). If you didn’t know, New York (Giants), Washington, Detroit, Minnesota, Atlanta, Tampa Bay, and St. Louis have all been eliminated. Less complicated for the top 5 seeds here, since we at least know who the 5 teams are. Four teams are competing for one wild card spot. All four division winners are known: New England, Cincinnati, Indianapolis, Denver. Kansas City has clinched the #5 seed (top wild card). I guess it depends on how your brain works, but I’m going to explain it in a less formulaic way first. Baltimore wins a two-way tie with Miami or a three- or four-way tie that includes the Jets. Miami wins any tie that (1) doesn’t involve the Jets or (2) isn’t a two-way tie with Baltimore. Pittsburgh would win a five-way tie that includes the Jets. San Diego wins no relevant ties, but they can finish with the #6 AFC record outright. I won’t be addressing what happens if a relevant game is tied next week, so keep the previous paragraph in mind. Since Pittsburgh is the the only team still alive with 8 losses, they would be eliminated if they tie next week regardless of any other results. The Jets have the same record as the Steelers do (7-8), but they have been eliminated due to their 4-7 record in conference. If you didn’t know, New York (Jets), Buffalo, Cleveland, Tennessee, Jacksonville, Houston, and Oakland have all been eliminated. I’m putting this last because I thought people would worry more about who’s going to be completely eliminated from the playoffs first. As of right now, Seattle and Carolina have clinched the playoffs in the NFC; but no division has been clinched. NFC East – The Eagles win the East by beating or tying the Cowboys. If the Cowboys win, they win the East. NFC North – The Bears win the North by beating or tying the Packers. If not, the Packers win the North. NFC South – If the Saints win and the Panthers lose, the Saints win the South. If not, the Panthers win the South. NFC West – If Seattle beats (or ties) the Rams or San Francisco loses (or ties) either remaining game, the Seahawks win. San Francisco only wins the division with wins in both remaining games and a Seattle loss. I’m not one for letting my fandom show excessively; but there is a time and a place for everything, and it’s called college football. 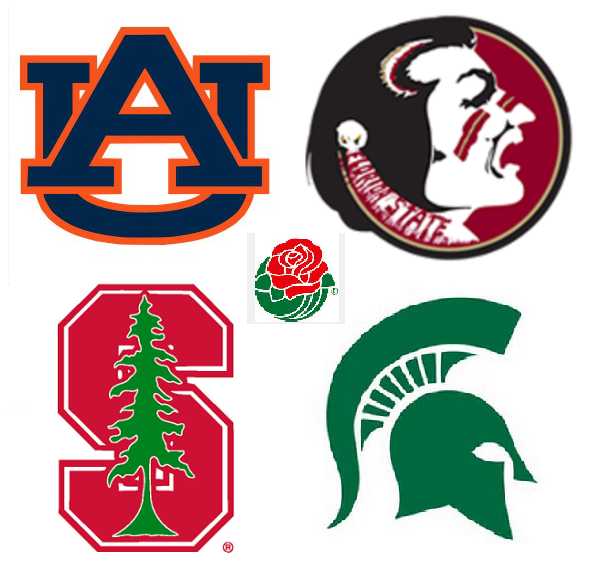 Before I get into that, I just wanted to note that I will have a lot to cover as far as my post-regular season, pre-bowl thoughts; but we have a couple weeks until there are any big games again, so I’ll spread them out over a few blog posts. At the least I’ll do some kind of review of the major BCS results and another look at the conferences. I might also do something about LSU’s history against the Big Ten, something like what I did with the Pac-12. Anyway, onto being a fan, I have to say that once again I’m disappointed with LSU’s bowl selection. I guess the addition of Texas A&M and Missouri to the SEC means that for Cotton Bowl purposes, there are 8 teams in the SEC West. Maybe Auburn will be the exception in the other direction one year, but I don’t remember that happening before. My bowl projections didn’t turn out too well because a couple of bowls didn’t pick the way I thought they should have, so there was a domino effect all the way down the list. I guess having “insider” knowledge helps after all. The top non-BCS SEC team is supposed to go to the CapitalOne Bowl, which also pays the most. Then the next-best West team normally goes to the Cotton and the next-best East team normally goes to the Outback. Missouri won the SEC East and finished ahead of South Carolina in the BCS, so they would have been the “normal” CapitalOne pick. Last season, the SEC made sure that Georgia got to go to the CapitalOne Bowl (multiple reports said that the CapOne preferred A&M, who ended up in the Cotton Bowl ahead of LSU, a team that beat the Aggies and tied them in the standings for the year). I think the difference this season was that Missouri wanted to go to the Cotton Bowl anyway, so they didn’t care about the CapitalOne picking South Carolina instead. Anyway, the result was that LSU couldn’t go to the Cotton Bowl, which is where the top available team in the SEC West is supposed to go after the CapitalOne Bowl makes its selection. So I’m not exactly expecting an inspired performance from the Fighting Tigers, but Iowa isn’t as good as Clemson was last year, so maybe the game will turn out better. LSU still should have won last year. I’m still annoyed with that even though I didn’t even care that much about the game at first. You would have thought a great defensive coach like Saban could have told a couple guys to run back toward the goal line ahead of the Iowa receivers, but I guess he was busy daydreaming about going to Miami. To put a positive spin on this year’s bowl game, having a replacement quarterback might actually be something that generates excitement, with no disrespect to Zach Mettenberger intended. It could be something along the lines of Matt Flynn’s performance in the Peach Bowl in 2005 (a 40-3 win over Miami) or at least Matt Mauck’s or Ryan Perrilloux’s wins in the SEC Championships in 2001 and 2007, respectively. In all three games, the quarterback of the future was suddenly made the starter, and LSU won the game. Mauck and Flynn would have championships in other seasons, so it was a preview of things to come (two years later in both cases: Mauck was hurt in 2002, and Flynn had a whole season of backup duty to JaMarcus Russell left); but that win was Perrilloux’s one big moment in the sun at LSU. Of course, I’m hoping Anthony Jennings is more like Mauck or Flynn but without having to wait on the sidelines next season. Anyway, my incorrect guess as to what the CapitalOne would do caused me to be wrong about both the SEC Cotton and the SEC Outback picks. My incorrect guess that the Orange would take Oklahoma caused me to be wrong several other slots. The first was the Sugar Bowl: had I known Oklahoma would still be available, I would have picked them for the Sugar Bowl. Then, since I thought the Sugar would take Oregon, this caused me to be wrong about all the Pac-12 bowls I picked. Everyone got knocked down a peg when only one team from the conference made a BCS bowl. Also the ACC teams moved one slot higher than I thought they would be. Had Clemson not made it, they probably would have returned to the Chik-fil-A (Peach) Bowl. Duke was my next choice had I known Clemson was going to the Orange. Aside from the remaining obvious BCS picks, I was right about a few things: Wisconsin is in the CapitalOne Bowl, Texas is in the Alamo Bowl, Texas Tech is in the Holiday Bowl, Georgia is in the Gator Bowl, and Texas A&M is in the Peach Bowl. I’m not sure why the Outback didn’t prefer Nebraska to Iowa. If they had, I would have been right about both teams in that one. I also think the bowls I had would have been better games. Alabama-Oregon, Ohio St.-Oklahoma, and Clemson-Texas A&M sounds much better to me than Alabama—Oklahoma, Ohio St.—Clemson, and Duke—Texas A&M. Georgia—Iowa and LSU—Nebraska (with our old friend Bo Pelini) also seems much better than the games we got. I was right about Nebraska going to Florida instead of to Arizona, where a lot of people had them. I just thought it would be Outback instead of Gator. That was really the only secondary pick I got wrong that wasn’t influenced by the two big ones. There was a change at #3 and yet another at #4. All of the top four will be going to Pasadena. Not much to say about the rankings. I think this might be the first time every top 25 team was either in the AP top 25 or the BCS top 25. I guess it will be the last time too, since this is the last BCS top 25 ever. I’m wondering if they’ll give us some kind of standings to look at next season. There was one team in both the AP and BCS top 25s that I don’t have, and that team is Texas A&M. The Aggies have one too many losses at this point without the corresponding quality wins necessary. It also doesn’t help that their only meaningful win since late October was over Mississippi St. I still think they’re one of the top 25 best, but the system is designed so that one-loss teams like Northern Illinois and Fresno St. don’t go too low, since if there is a Boise St. or Utah (like the ones who won major bowl games in recent years) with one or two strong wins they can be up into the top 10 somewhere. Not everyone deserves a shot at the top 2 either though. The only other thing I thought was interesting was the switch at #25. USC and U. Miami were both idle, but it’s interesting that USC played 9 conference games as well as playing Notre Dame, which happened to have played both Stanford and Arizona St. Since the Cardinal and the Sun Devils strengthened their own schedules by playing one another, they also strengthened the rest of the Pac-12 and Notre Dame. Also, it helped that Notre Dame beat Michigan St., which of course added its most impressive victory of the season by beating Ohio St. 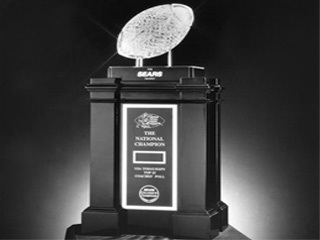 The final BCS championship with be decided on January 7. The BCS Standings have not been released yet, so I’m going to use my own rankings. (1) #1 plays #2, based on the BCS Standings. 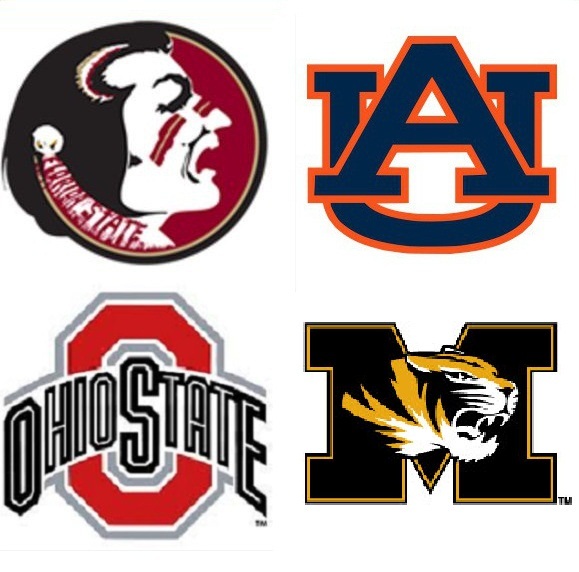 There is almost no doubt the two teams will be Florida St. and Auburn. Florida St. is the only unbeaten team in major college football. Auburn has clearly had the best schedule among one-loss teams and won the SEC over Alabama and Missouri, who would both be in the top 5 had their seasons ended before playing Auburn. (2) If the #1 team would otherwise be designated for a certain bowl game, that bowl gets a replacement pick. I’m pretty sure the #1 team will remain Florida St. since they were #1 going in and won convincingly. So that means the Orange would get to pick first. I think they’ll pick Ohio St. That’s the best team not in the BCS Championship or Rose Bowl, and they bring fans to games pretty well. There is an agreement not to pick the #2 team from another conference, so I don’t think Alabama would be going here. (3) If the #2 team would otherwise be designated for a certain bowl game, that bowl gets a replacement pick. The second bowl to pick will be the Sugar Bowl. Despite a great season by Missouri, Alabama is a better draw. Most people already regarded Alabama as the better team before Missouri’s loss to Auburn. Unfortunately, there are only two teams allowed per conference. (4) Remaining slots will be selected based upon the rotation for a given year. In order to pick an “at-large” team, slots must be available for the automatic bids. (4a) Orange My guess is the Orange will jump at an opportunity to recall the old days of picking Big 8 champions and go with Oklahoma. They could pick Clemson instead, but other than not losing to anyone but South Carolina and Florida St., what has Clemson really done? Also, I know South Carolina is a crazy football state, but they’re just not on the same level. (4b) Sugar You might remember that a week ago people were saying that for the second selection, the Sugar would have to decide between UCF and Northern Illinois. That would have been true had Northern Illinois won; but since the Huskies lost, that opens up another at-large slot. Clemson might have a good argument here, but I think people would be more excited about Oregon. It wasn’t too long ago that Alabama was #1 and Oregon was #2. I think that would be a more exciting match-up. Ducks fans probably wouldn’t travel as well as Clemson Tiger fans though, so I’m not 100% sold on this. (4c) Fiesta Unless the Orange or Sugar pick Central Florida, the Fiesta Bowl will have to. Baylor automatically goes as a result of winning the Big XII. As to the non-BCS Bowls, there is more leeway. Last year, a very good SEC team that lost the Championship for its second loss went to the CapitalOne Bowl, which is meant to be the top SEC non-BCS bowl. I expect the same this year. Although conceivably Missouri could lobby to be in the Cotton instead of LSU, usually the Cotton goes to an SEC West team; and I think the Cotton would be happy with LSU, which has been a good draw in Arlington a few times recently, including playing Texas A&M in the Cotton a few years ago and playing Oregon and TCU to start the year in 2011 and 2013, respectively. Les Miles vs. Oklahoma St. would of course add some intrigue to the game. Although Texas was one win away from the Fiesta Bowl, I think it would only be fair if it is the #4 Big XII team selected with its two non-conference losses. So that slot is the Alamo Bowl, which is of course in Texas and should be happy to have them. Arizona St. is pretty close for a Pac-12 school, so they’ll be a good pick to play the Longhorns. The Pac-12 #2 (or top available after the BCS) has gone to the Holiday Bowl before, but that’s not the way it works now from what I understand. South Carolina always seems to end up in the Outback Bowl, but it’s a result of being in the SEC East and not one of the top 3 selections when there are two SEC teams in BCS bowls. I don’t see another logical place to put them. There is some talk of LSU going to the Outback Bowl if Missouri goes to the Cotton and frees up the CapitalOne Bowl for South Carolina, but I don’t think that’s fair to either the CapitalOne Bowl or to LSU. LSU was brushed aside for the Cotton last year in favor of A&M despite having beaten the Aggies. But Texas A&M wasn’t given the option of the “better” CapitalOne Bowl, which got Georgia. Iowa beat Nebraska, but they’re both 5-3 and I would think the Outback would go with Nebraska for its well-known supportive fan base. I mentioned the Holiday Bowl earlier. They may pass on UCLA to vary things up a bit, but I suspect they won’t. It just seems to make too much sense. It’s also possible that the Alamo and Holiday could switch Pac-12 teams, but I don’t think that would be an improvement for either. If Oregon does not get into a BCS bowl, they may bump either UCLA or Arizona St. to the Sun Bowl. The pickings in the Big XII start to get slim, but Texas Tech looks like the best possibility. Kansas St. is another. Texas A&M has been slotted for the Chick-fil-A bowl for a while, particularly by those prognosticators who didn’t pick them to beat Missouri. Since the time it was the Peach Bowl, this has been known for fun, competitive games, and I don’t think Clemson would disappoint. The Tigers won by a single point last year, but I don’t think the bowl would be enticed by Duke. It’s basketball season at that school. Georgia has had an up-and-down year and they play in Jacksonville every year anyway, but I still think the Gator makes a lot of sense given its proximity to the state of Georgia. I think enough Georgia fans live far enough away to get hotel rooms and so forth, but they’ll still show up in big numbers. I’ve seen Michigan projected here, and they’re always a good draw too. I’m hoping the politics don’t allow the Wolverines to pass up Iowa and Minnesota, who both finished with better records. It wouldn’t shock me though. Sorry for getting this out late. I was waiting on responses longer than usual (there are only 5 entries this week), and it just wasn’t possible to do this yesterday. It’s contentious toward the top. Voters that really like Auburn seem not to like Ohio St. and vice-versa. Florida St. still got a majority of the #1 votes and got #2 votes from both Ohio St. supporters for the top spot. No. 4 was interesting because two voters had Alabama two spots below Missouri, and another had the Tide two spots ahead of the Tigers. The other two had Alabama one vote ahead. So three of the five did think the Tide should go in front. That’s why they’re on top in the image above. The Pac-12 seemed to benefit the most from the absent voters as all three teams moved up significantly even though they were all supposed to win and Oregon didn’t even look good doing it. LSU was “jumped” by Central Florida and Oklahoma, who also gained four spots. LSU remained #17 though. Duke went up the most, improving by six spots. Clemson and Wisconsin fell eight spots apiece after losses. Fresno St. only fell six spots. Georgia also gained several spots to get into the top 25 (although they’re still significantly behind those other Bulldogs in points), in part because of Auburn’s win over Alabama. Georgia is ranked for the first time since Week 7. Texas rejoined the top 25 after a two-week absence. It didn’t take much to become ranked this week, as there was a lot of disagreement over who the last couple of teams should be. Very little separates the top four, especially the top two. In case you missed it, I wrote a blog yesterday about the changes to the Thanksgiving rivalries. The first part of this is based on the national-championship race, then I’ll get into the other changes to the rankings. I’ll just get to the point. If there weren’t championship games, I would absolutely want Florida St. to play Auburn for the title. If Auburn beats Missouri, I’m not changing my mind about that one, but I’ll wait and see on Ohio St. I don’t factor in margin of victory in my ratings; but as a fan, I lean heavily toward Florida St. because no one has given them a game yet. It would be a shame to do everything they could be expected to do and not get to play for a title, assuming they beat Duke. The main thing I wanted to do was just to give a summary of where the big opponents (defined as the top 60 teams in the FBS) of the four major title competitors rank in my new ratings. Ohio St. has more wins from #30 to #60, but I think based on what I’d call good opponents (top 30), there are more teams that can go undefeated against Ohio St.’s schedule than Florida St.’s schedule. I think even 7-5 Michigan was perfectly capable of going undefeated against Ohio St.’s schedule so far. Ohio St. didn’t play Michigan St. (the only team to beat Michigan convincingly) or Nebraska (who beat Michigan by 4), and Michigan only lost by a field goal apiece to Penn St. (in OT) and Iowa. Michigan did beat Notre Dame, which I think is about as good as Wisconsin, Ohio St.’s best win. You can see why I wouldn’t necessarily endorse Missouri over an undefeated team. Even with the win over Auburn, that’s still just one top-20 win. Two top-25 wins, but Florida St. would have three. If you start talking about teams below the top 25, that might be an advantage in arguing against Florida St., but it would be a disadvantage in arguing for Missouri against Ohio St. I just think it should be a clearer case before you put a team with a loss in instead of an undefeated team. Auburn qualifies; Missouri probably doesn’t. This is another way of looking at it that I saw on another blog. 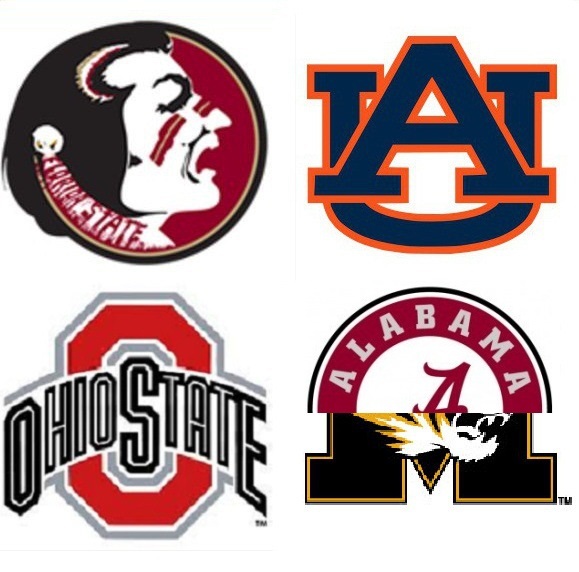 I had a feeling I was going to end up regretting that the 4-team playoff didn’t start this year (Alabama would be the natural fourth, although I have to admit I’m personally glad they seem to be out of the running); but if Ohio St. or Florida St. ends up losing, then it would be the perfect two-team outcome. If they both lose, then maybe we can get another all-SEC championship. To get to the rest of the top 10, Alabama stayed in the top 4 in the major polls, but computer formulas treat a loss as just a loss. It also doesn’t help that the Tide’s SEC East opponents were Tennessee and Kentucky. Arizona St. also edged in front by beating Arizona. It’s likely that Stanford would take Arizona St.’s place in front of Alabama with a win. Northern Illinois could pass up one or two of the conference-championship losers. Michigan St. of course could gain a few spots by beating Ohio St. Baylor can also capitalize on others’ losses if they get past Texas. Below the top 10, Oklahoma St. fell a few spots by being idle. The same principle applies to them as to Baylor except that OSU plays a btter team. One team they may pass up is South Carolina, which jumped five spots by beating Clemson, which went down six spots. Oregon went up six spots after beating Oregon St. UCLA and Duke also went up considerably after winning their rivalry games. Fresno St., Wisconsin, and Notre Dame all fell a bit by losing. USC and Texas A&M were in the last few teams last week, so they couldn’t stay in the top 25 with their losses. Georgia beat Georgia Tech, and it also helped out that Auburn and Missouri won. Miami’s win over Pittsburgh, combined with with losses by others, put the Hurricanes back into the top 25. I did make a small adjustment to how losses to FCS teams are treated, but of course all the revelant teams are outside of the top 25.